View of the front side of the historical monument, as it appears today, with the monument's metal plaque missing. 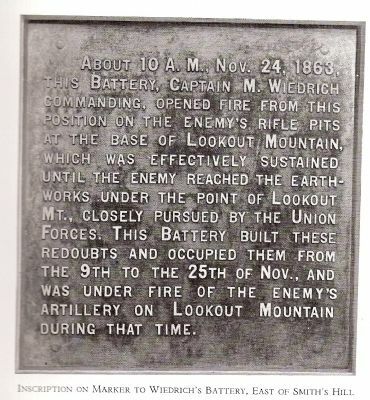 About 10 A.M., Nov. 24, 1863, this Battery, Captain M. Wiedrich commanding, opened fire from this position on the enemy's rifle pits at the base of Lookout Mountain, which was effectively sustained until the enemy reached the earthworks under the point of Lookout Mt., closely pursued by the Union Forces. This Battery built these redoubts and occupied them from the 9th to the 25th on Nov., and was under fire of the enemy's artillery on Lookout Mountain during that time. 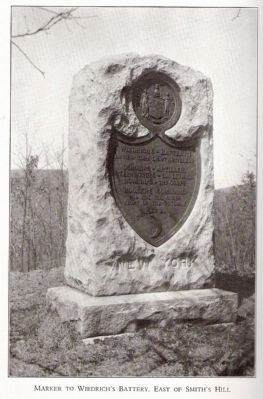 View of the historical monument as it appears in the New York monument commission book. This marker is included in the Chickamauga and Chattanooga National Military Park: November 24, 1863 marker series. Location. 35° 1.689′ N, 85° 21.342′ W. Marker is near Tiftonia, Tennessee, in Hamilton County. Marker can be reached from Parker Lane east of Brown's Ferry Road. Touch for map. This historical marker was difficult to locate, in fact it has taken me about five years to locate. 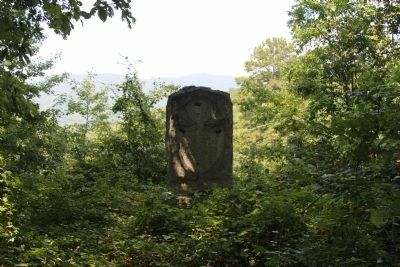 According to the location information provided by the National Park Service, “This monument is located at one of the Park's most remote units... Wauhatchie Site 3. (Parker Road, Lookout Valley/1934 Map 203)." The National Park Service then goes on to say, "This site has no public access," but that's not completely true. To reach the historical marker one must first locate the street, Parker Lane, which is situated at the first street intersection on Brown's Ferry Road just south of Interstate 24. From Brown's Ferry Road, turn east onto Parker Lane. After driving on Parker Lane for a little over a block the pavement gives way to a rough gravel roadway and bends northward. After a short distance, you leave a commercial area and go into a densely wooded area, where the condition of the unpaved roadway deteriorates. Close-up view of the front area on the monument where the metal plaque is missing. on the north side of this bend that one can see the Von Steinweher historical monument. Continue heading south beyond this monument. After a short distance you will emerge from the woods into a clearing, with a junction for a service road to your left. Overhead you will see a power line that runs west to east across the roadway. To your left you will see what must be a service road for the power lines. 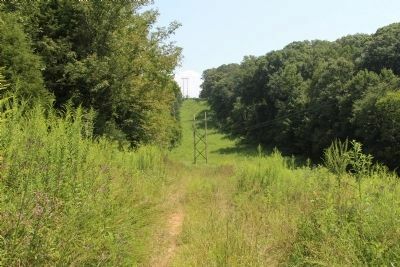 If you visually follow follow both the power lines and the service road, you will see that after about a quarter mile both the power lines and the service road climb up a steep ridge and disappear over and beyond the top of the ridge. This historical marker is on the crest of the ridge, just inside of the woods, to the right of the service road and power lines. I drove my Toyota mini-van on the service road, that became two continuous ruts through some fairly tall grass, all the way to about the base of the ridge, but from there on I had to walk, because I didn't believe that my mini-van could manage the steepness and poor condition of the roadway, up the slope of the ridge. Marker is in this post office area: Chattanooga TN 37419, United States of America. Touch for directions. 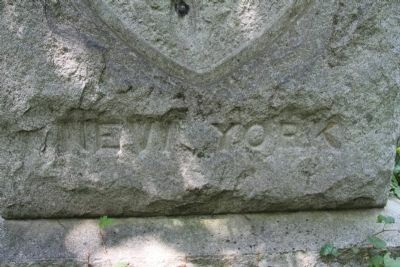 Close-up view of the "New York" inscription into the front base stone of the monument. mile away); Battle of Lookout Mountain (approx. 0.6 miles away); Brown's Ferry (approx. 0.8 miles away); Battle of Wauhatchie (approx. 0.8 miles away); Heavy Slashings of Timber (approx. 1.1 miles away); Lookout Mountain (approx. 1.2 miles away); Camp Ross (approx. 1.2 miles away). Touch for a list and map of all markers in Tiftonia. More about this marker. Things have changed a bit since my last trip to the site of this historical marker, back in the summer of 2013. Upon visiting the Chickamauga and Chattanooga Battlefield National Park's Visitor Center, and talking with several members of the National Park's staff I discovered that they were being much more diligent about locking the gate (something that I never experienced in the past whenever I had visited this area of the National Park). So now one must leave their vehicle by the locked gate and go entirely by foot to the historical marker. It is about a half mile walk, one way, to this particular historical monument. 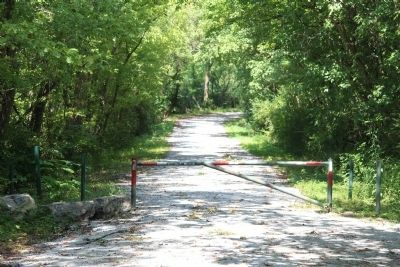 Because the park staff has been locking the gate for some time, and far fewer vehicles have been using the service road, the service road is currently much more overgrown with vegetation. In preparing for my march to the historical marker, on a hot, 95° day, I made sure that I used my bug spray (I was particularly worried about ticks), that I wore my hat, that I took my cell phone, and that I packed several bottles of fluids to take with me (I should have included a towel to use to wipe all of the perspiration from my forehead). I followed the main service road in, and about a tenth of a mile in, I noticed the power lines crossing the roadway, overhead. 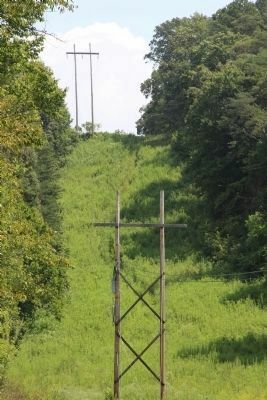 That was my signal to turn left and to use what barely looks like a functional service roadway, and to follow the power lines to the top of a nearby hill (see travel pictures below). For me, it wasn't so bad until I got to the base of the hill. It was a fairly steep climb and the climb up was no small accomplishment for an overweight 63 year old, with two bad knees that go all the way back to my college football days. However, the toughest part of the hike for me was the climbing back down the steep hill. Once you have reached the clearing at the top of the hill, you will find the monument in the deep woods immediately to your right. If you don't initially see the monument, just go into the woods and head slightly to your right and you should be able to see the monument within one to two minutes. While approaching the monument you will notice that the entrenchments on the top of this hill are still clearly visible, and after taking some pictures of the monument you may want to look at some of the nearby earthworks. This site is referred to as Wauhatchie Site #3 on the Chickamauga and Chattanooga National Park map. 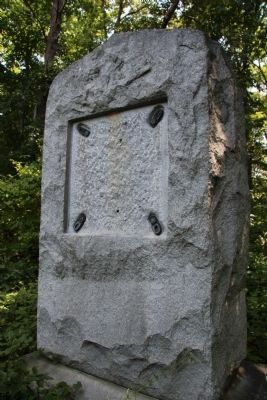 According to the description information provided by the National Park Service, the monument is, “6'4" x 4'4" x 11' high, the rock-faced granite monument consists of a peaked-top vertical slab on a base. 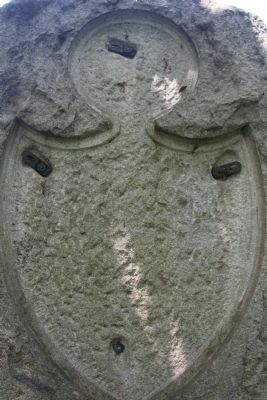 Missing from front are a shield-shaped bronze plaque and bronze state seal. "NEW YORK" is inscribed below plaque area." Regarding Wiedrich's New York Battery. Both of the plaques, front and back, from this historical monument, have been stolen, probably by scrappers. I found the text for this marker by visiting the Battlefield Wanderings Blog, where I found pictures, showing the text, on both the front and back side of the monument. This information apparently came from the New York Monument Commission. View of the back side of the historical monument, as it appears today, with the monument's metal plaque missing. View of the text, on the plaque, on the backside of the historical monument, as it appears in the New York monument commission book. View of the landscape that one most cross in order to reach the historical monument that is situated at the top of the hill in this picture. View, from a bit closer than the preceding picture, of the landscape that one most still cross in order to reach the historical monument that is situated at the top of the hill in this picture. 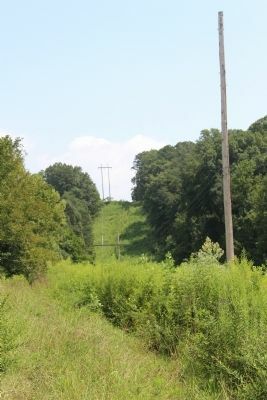 The historical monument is located in the woods, just to the right of the power line poles that are located at the top of the hill in this picture. 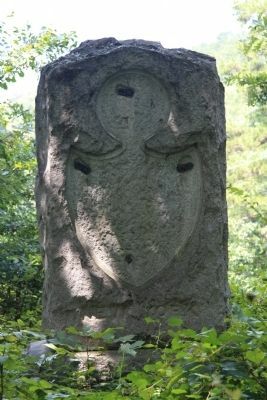 View of the historical monument, seen in the woods, at the crest of the hill. 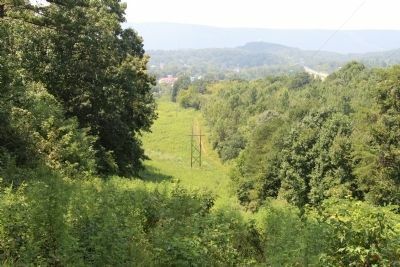 View of the landscape that one must travel, as seen from the top of the hill where the historical monument is located. View of gate that the National Park system has placed across the roadway. One must park their vehicle beside this gate and travel by foot from this point on, in order to visit this particular historical monument. More. 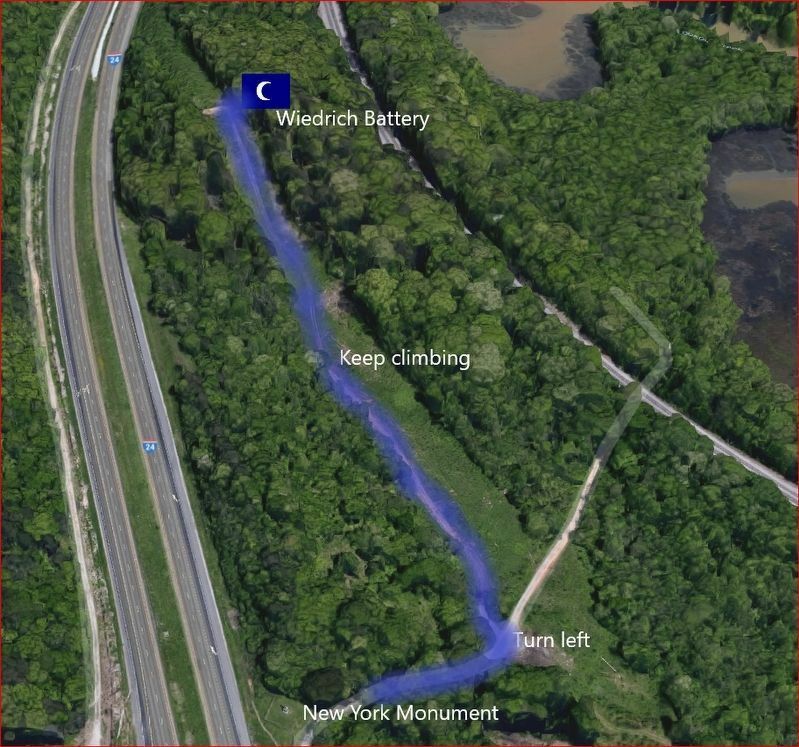 Search the internet for Wiedrich's New York Battery. Credits. This page was last revised on February 27, 2019. This page originally submitted on November 13, 2013, by Dale K. Benington of Toledo, Ohio. This page has been viewed 524 times since then and 39 times this year. Last updated on February 24, 2019, by Darryl R Smith of Cincinnati, Ohio. Photos: 1, 2, 3, 4, 5, 6. submitted on August 20, 2014, by Dale K. Benington of Toledo, Ohio. 7, 8, 9, 10, 11, 12. submitted on August 21, 2014, by Dale K. Benington of Toledo, Ohio. 13. submitted on February 24, 2019, by Darryl R Smith of Cincinnati, Ohio. • Andrew Ruppenstein was the editor who published this page.